There was a time when Cesar Alvarez was the one doing the rescuing. But the retired Los Angeles firefighter now focuses his attention on the things that saved his life -- a test that led to a diagnosis of liver cancer and the liver transplant that allowed him to regain his health. You can see the firefighter's heart in Alvarez's commitment to doing all he can to educate others about paying attention to signs of illness and the real impact of organ donation. Last weekend in Phoenix, Alvarez was doing just that at the annual Liver Life Walk, which raised more than $125,000 for liver disease education and research. And he told ABC 15 News that, "As long as I can, I'm going to keep doing this and keep getting people motivated and educated on what they need to do if they need a liver transplant." 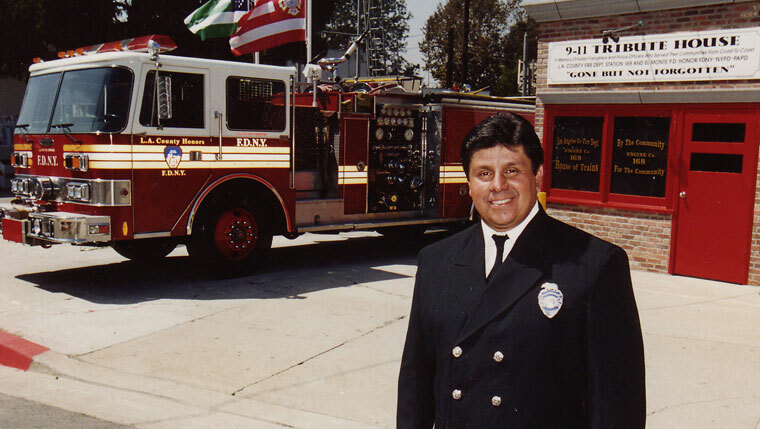 Alvarez shares his story, from his firefighting days to the present, in a post on the Liver Life Walk website as the 2014 Mayo Clinic Liver Life Walk LIVEr Champion. He writes that the "greatest part of being a firefighter … was being able to make a difference in people's lives day in and day out." He retired after an on-duty injury in 2006 resulted in several surgeries, hospitalizations and "lots of anti-inflammatory drugs and pain medications." After retiring, Alvarez and his wife moved to Peoria, Ariz.
Not long after the move, he started feeling fatigued and weak. A doctor suggested depression, but Alvarez writes, "My skin color and the color inside of my eyes started to get real yellow." A liver specialist in Glendale, Ariz., diagnosed him with NASH (nonalcoholic steatohepatitis) and told him he would need a liver transplant. That brought him to Mayo Clinic and the transplant list. His condition rapidly worsened, but Alvarez got his transplant on Oct. 19, 2010. "I remember waking up in ICU and hearing people talking to me," he writes. "Once I was able to open my eyes everything in the room seemed brighter and clearer … I was alive, and I knew I had been given a second chance, and it felt so good." Three years and change later, Alvarez says he's "on a path to help others by donating my time to Dona Vida Arizona and Donate Life of Arizona." And he has a few words for his friends at Mayo Clinic who helped make that possible. "The one thing that I will never forget was the way I was treated at the Mayo Clinic … from the housekeepers that kept my room clean; to the ladies that brought my meals to me every single day; to the technicians that did all the scans and lab work; to the nurses that watched over me 24 hours a day; and to the doctors who made it their mission to save my life," he says. "I knew inside that they truly cared, and that alone, made me want to fight even harder to stay alive." Learn more about Alvarez and Team Mayo here. Then share your comments over here, on the In the Loop blog.